Call for speakers: the third annual Philadelphia Women in Tech Summit, happening this year April 12, 2014 as part of Philly Tech Week, is accepting speaker proposals! Apply to speak by Jan. 10, 2014. Philly Women in Tech Summit, 2013. I attended this event in 2012 and 2013. At both events, I had a great time, learned a lot, met some awesome people and felt way more engaged in the community afterward. I highly recommend marking your calendar. Read the recap I wrote on the inaugural event in 2012 here. When I was writing that recap for Flying Kite in 2012, I took photos at the event. As an example of how much more familiar and engaged I am with the community 1.5 years later, I had initially recognized maybe two or three faces in a large crowd shot I’d taken (pictured below). Looking back that photo today, I recognize at least 5x as many (and would likely recognize more if it were less blurry). Inaugural Philly Women in Tech Summit, 2012. Give speaking a shot if you’ve got an interesting topic you’d want to present on. GDI SF Chapter Leader, Pamela Fox shares some great tips on her blog for speaking as a way to network at conferences and has some helpful shyness hacks for speaking. 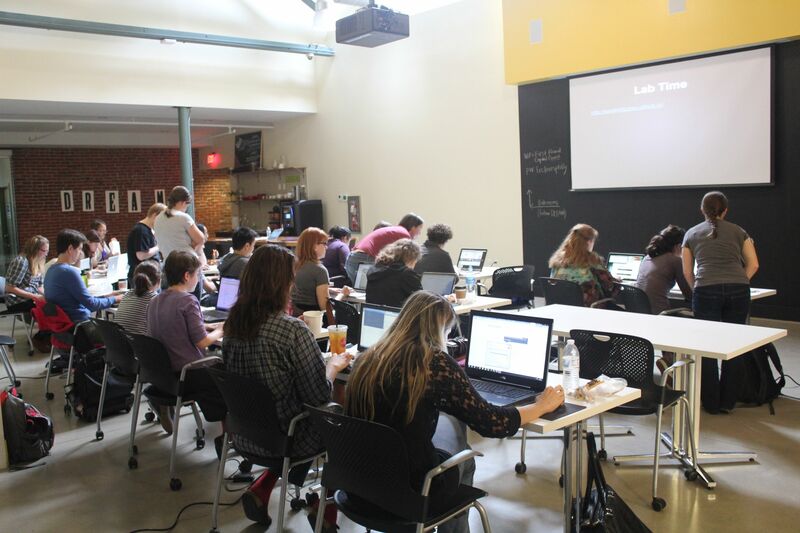 There’s a really awesome resource site called Ladies in Tech (started by some wonderful ladies who are also GDI Philly instructors), whose mission is to offer advice for women who want to speak at tech events. Take a look at some of their articles (with great posts titles like From Public Freaking to Public Speaking) and listen to their new podcast. Again: Mark your calendar for the Women in Tech Summit on April 4, 2014, the final day of Philly Tech Week 2014. I have a few New Year’s resolutions, but among my most important is to update my site/blog more often. A Girl Develop It Philly year-end review is a bit overdue, but I’ll promise it here so that I might be held to it. So, coming up…GDI Philly 2013 Year Review! In the meantime, check out our upcoming classes and workshops on our Meetup.